We propose a supplementary technique in repairing the fusiform lesion by initiating closure at the apices and working toward the center of the defect. This method allows easier closure of wounds under high tension and mitigates the need for extensive undermining as typically experienced when working on the scalp or back. Additionally, ideal scar length can be secured by virtually eliminating apical standing cones, a consideration when working between sensitive cosmetic subunits such as the lip or the eye. Resident Salaries: How Do You Measure Up? Since 2015, the average resident salary has increased by about seven percent to $59,300, the latest Medscape Residents Salary and Debt Report shows (available at Medscape.com). 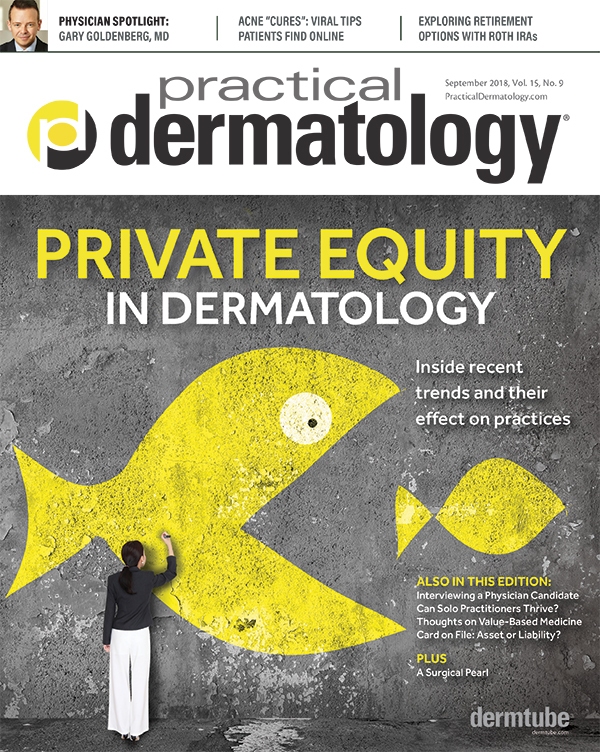 Whereas dermatologists are among the highest paid specialist physicians overall, dermatology residents do not lead in terms of earnings for phsyicians in training. In fact, at $58,600 averge salary, dermatologists earned less than the overall resident average and were among the bottom 10 specialties in terms of earnings, along with Internal Medicine, Family Medicine, and Public Health and Preventative Medicine. The gender wage disparity begins in residency, apparently. On average, female residents earned $900 less than men. Although half of residents feel they are fairly compensated, nearly one-third of residents believe their paycheck should be 11-25 percent higher, while 36 percent of respondents would like to see 26-50 percent more pay. The top cause for salary dissatisfaction is a perceived mismatch between compensation and hours worked (82 percent), followed by perception that compensation is not comparable to other medical staff (69 percent) and compensation does not reflect required level of skill (68 percent). 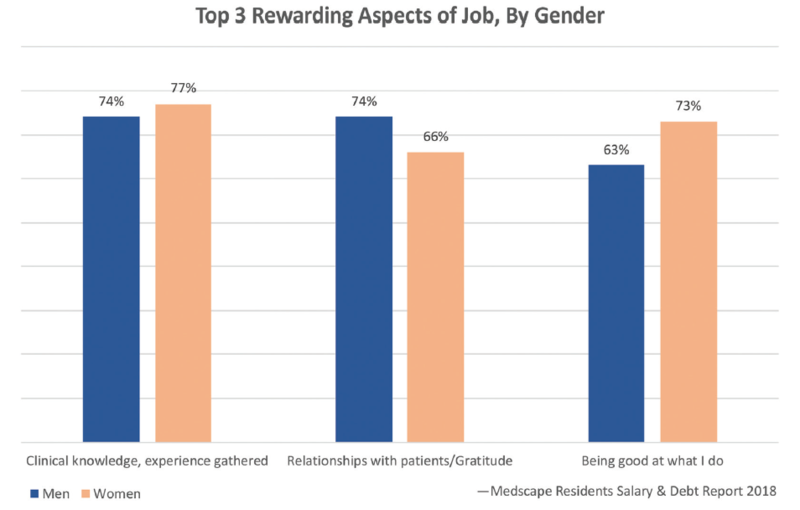 Data reveal that residents find many aspects of their career rewarding. See the chart for more. 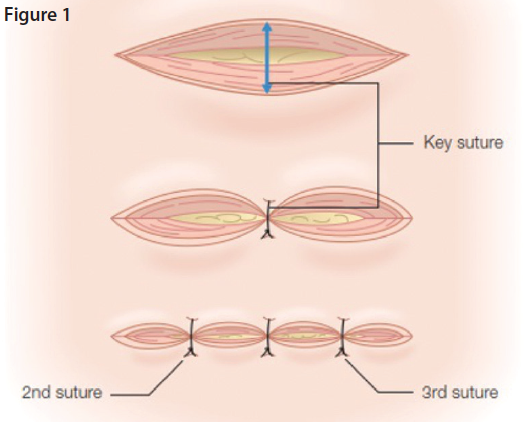 The first suture will be placed at either apex of the ellipse using standard techniques of interrupted buried dermal sutures (Figure 2). Sutures are then placed in an alternating pattern approaching the center of the defect. With each subsequent suture placement, the surgeon will be able to appreciate reduction of tension at the center of the wound and can therefore minimize the amount of undermining that is necessary for approximation. One important consideration when utilizing this method is that standing apical cones are not likely to occur, since the apices are closed first. A standing cone at the center of the lesion is still possible, and if that cone needs to be corrected, a small perpendicular scar will be created upon repair. The formation of a perpendicular scar may be preferable in some situations when working around cosmetically sensitive areas where anatomic function would otherwise be compromised, such as the formation of an eclabium or ectropion. Although it may not be suitable for all situations, this supplemental technique may prove useful for repairing defects under high tension or when scar length must be preserved. Drs. Navid Malakouti and Pavan Nootheti have no relevant disclosures or conflicts of interest. Special thanks to Mr. Gary Strange, Visual Information Specialist at Washington, D.C. VAMC, for assisting with the creation of Figure 2. Navid Malakouti, MD is Chief Resident at Howard University Hospital, Department of Dermatology in Washington, DC. Pavan Nootheti, MD, FAAD, FACMS is Chief of Dermatologic Surgery and a Mohs surgeon at the Veterans Affairs Medical Center, an Associate Professor at Howard University Hospital, Department of Dermatology, and Clinical Associate Professor at George Washington University, Department of Dermatology in Washington, DC.